Is It Less Expensive To Build Up Than Out? The short answer is no – building up on an existing house is always more expensive than building out. Sometimes, however, you have no choice if there is no room on your lot to build out. Why is Building Up More Expensive? Usually the existing foundation has only been designed to support one story and would have to be added onto in order to support two stories. In addition, interior load-bearing walls might need to be added necessitating demolition of parts of the existing floor for installation of additional footers. Either part of the existing house space would be lost, or real estate outside would need to be built two stories tall, to provide space for a staircase to access the second floor, and there’s the cost of the staircase itself as well. Then there’s the cost of removing part of the existing roof and reworking electrical, mechanical, and possibly plumbing systems. There’s more, but by now I think you’ve got the point. If you have specific questions about any home improvement project, please call me at 561-795-2551 or email me at: todd@leadingedgehomes.com and I’ll be happy to share my knowledge with you. Great bathroom idea – no shower doors or shower curtains needed! 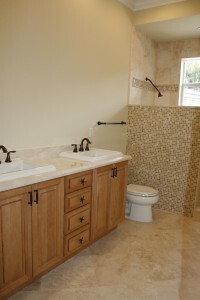 Your bathroom is one of the most heavily trafficked places in your home. Bathrooms need updates and maintenance because the constant use and moisture may contribute to the breakdown of the major components over time. Your family’s changing needs may also require an update including taller or shorter counters, handicapped accessibility or other modifications; or you may want to get a fresh start by revising a layout, remodeling to add storage, or replacing fixtures. ● Wall materials – tile, cultured marble, granite, etc. ● Lighting – recessed, wall-mounted, sconces, etc. 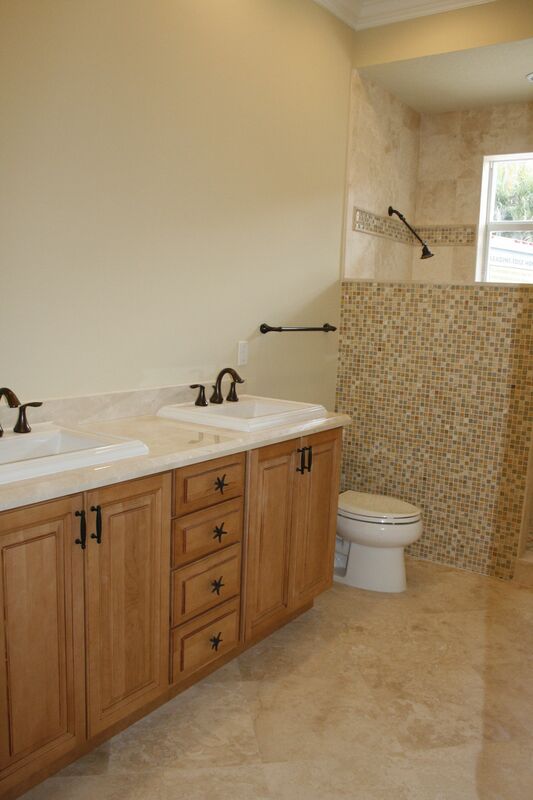 If you are considering a bathroom update or adding a new bathroom and have questions, you can contact Leading Edge Homes, Inc. through their website, complete the comment section of this post, or call 561-795-2551. Leading Edge Homes, Inc. is a Florida certified building contractor specializing in improving your lifestyle through room additions, bathroom renovations, kitchen updates, and hurricane-resistant screen enclosures. In business since 1991, the most important thing they demolish is your stress and build is your trust. Contact them at 561-795-2551 or visit their website to discover how they can help you with your next home remodeling project in Palm Beach County.